Also, there was the Spartan nature of his personal life and his remarkable unity of activism and contemplation. "He says his prayers before going to bed", Naipaul tells us. "He is up at five and goes to mass at 5.30. He does not worry through to political decisions; they come to him after a night of prayer and rest; and he is in his office punctually at eight". Even his enemies, according to Naipaul, admitted that neither age nor power changed George Price. He was not interested in money; he was known to give away money. And, of course, he was ceaselessly touring the country in that Land Rover, always greeting, always checking. Is it any wonder that he came to be called the Father of the Nation? Visionary that he was, George Price himself tells us that he fixed his mind on independence from the time in 1949 when the Governor used his Reserve Power to devalue the British Honduras dollar. To understand just how much of a seer this made him, we have to recollect that this was well before decolonization came into vogue; well before the seminal 1960 UN Declaration on the Granting of Independence to Colonial Countries and Peoples. He was way ahead of his time and it was only the security obstacles thrown up by the Guatemalan claim that prevented him from early realizing his dream; and prevented Belize from becoming part of that first great wave that swept so many new nations into being in the 60s and 70s. But the arch-nationalist in George Price never let go of the struggle for freedom. When finally we won independence, it was after a hard-fought internationalization campaign and in circumstances that were peculiar in the post-colonial world. I speak, of course, of the defense guarantee that Mr. Price succeeded in wresting, against all odds, from the British. Linda you scored big. 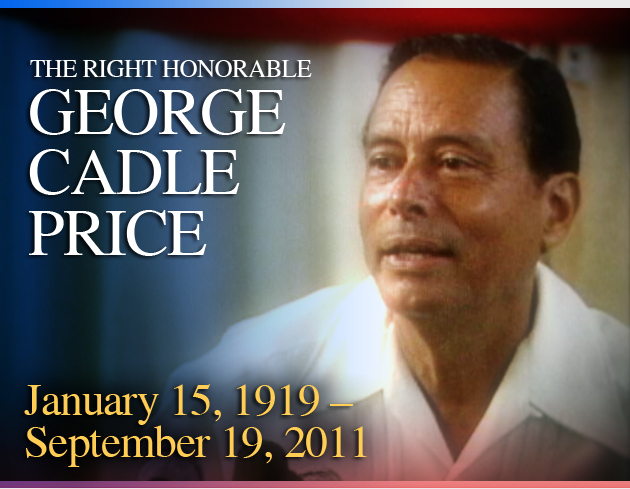 Thanks for sharing this tribute by our Prime Minister of the late Honorable George Cadle Price. This was a very touching tribute. It was very comprehensive and fitting. Prime Minister's tribute to Hon. George Cadle Price was fitting, and delivered with class and eloquence. So proud of you Prime Minister Barrow! A most eloquent and respectful presentation by Prime Minister Barrow. The absolute national unity triggered by the passing of former Prime Minister the Rt. Honorable George Price was firmly consolidated by Mr. Barrow's historic speech. The truly non-partisan, non-political and gracious nature of the speech was a display of mature statesmanship, and outstanding leadership. The father of the nation would have been very proud. It was a tribute befitting the greatest son that Belize have ever produced. As Mr. Barrow said: "Mr. Price was a giant of a man".....May his legendary legacy live on. REST IN PEACE Rt. Hon. Prime Minister George Price. As always I am touched as I see the somber pageantry of Hon. Price's final farewell through your eyes. I am truly appreciative to you for sharing with us what we were not able to witness ourselves. Fitting tribute to a great man. He was the ultimate politician yet acompassionate leader of all Belizeans. Thank you Linda,this is a wonderful acknowledgement; I will print and keep it in my file that I keep with article such as this.